The governors of the three West Coast states have vowed to step up their efforts to fight climate change in the face of the incoming administration of President-elect Donald Trump, who has dismissed global warming as a hoax. Democratic governors Jerry Brown of California, Jay Inslee of Washington and Katherine Brown of Oregon made stark warnings this week that climate change was already harming the Pacific Ocean along which their states lie. “Our waters are at mortal risk,” said Inslee, speaking via video-conference at a meeting of the International Alliance to Combat Ocean Acidification, in advance of the winter meeting of the Western Governors Association this week in Coronado. The three governors said they had joined the alliance, a group of U.S. states and countries including Chile and France dedicated to reducing rising acidity in the oceans, a phenomenon tied to climate change that threatens fish, coral reefs and other marine life. The actions marked the latest in a series of moves by Democrats, led by California, to position themselves to fight efforts by Trump to undo progressive policies on the environment, immigration, healthcare and other issues. The three coastal states are also among eight U.S. states and the District of Columbia to have recently legalized the recreational use of marijuana, actions that may also conflict with the agenda of the incoming Republican administration. A conservative populist who campaigned against illegal immigration, expressed skepticism of the science behind climate change and vowed to repeal Obama’s signature healthcare law, Trump has said he wants cabinet members with similar beliefs. Earlier this month, the California governor nominated Xavier Becerra, a lawyer and longtime California congressman to be attorney general in a move widely viewed as preparation to defend state policies against a Trump Administration. 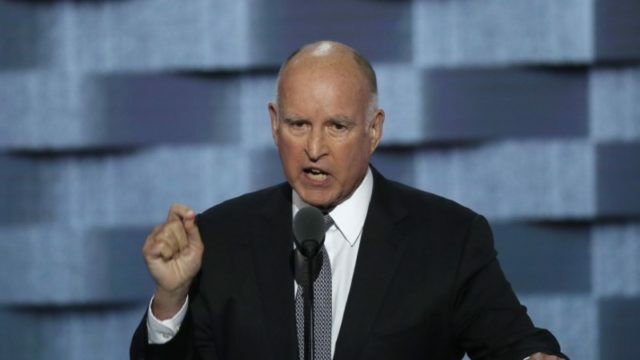 Brown said that despite whatever obstruction the incoming Trump Administration poses to efforts to combat climate change, California would do everything possible to prevent catastrophic global warming and ocean acidification. The oceans absorb 90 percent of the world’s greenhouse gases, and supply much of the world’s food. “Whatever problems we have today, they will pale to the stresses that we are going to have by rising sea levels, the threat of tropical diseases, and all manner of extreme weather events,” Jerry Brown said.